This peaceful, intimate 58-room oasis features contemporary design in a secluded beach setting just within the Atlantic Ocean and beside the Caribbean Sea. Aside endless pearly soft beaches, near rugged iron-shore outcrops, it faces some of the most revered reef walls and dive sites in the world. Guests may choose from relaxing at the pool and spa, play a round of tennis or go sailing. Snorkel trips and use of kayaks are included. Guests also enjoy a movie screening room and library. 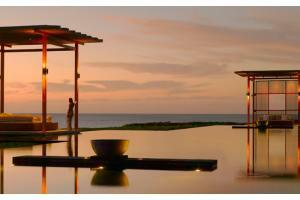 Amanyara is situated on the island of Providenciales. It borders the pristine reefs of the Norwest Point Marine National Park. Restaurant offering Asian and Mediterranean cuisine; Bar offers drinks and light meals. Cheshire Hall, Sapodilla Hill, "The Hole"